Hamburger scamsters out there, take note! Thirty-five year-old Akira Watanabe was recently nabbed for trying to pull a fast one—with a hamburger and a hair. The unemployed man apparently returned a burger he had order, saying it had a hair in it and that he felt sick and couldn't eat. The hair, it seems, was Watanabe's. The fast food restaurant called the police, because Watanabe was firm with his demand for financial compensation as he claimed the hair burger made him feel awful. Police arrived at the fast food chain and booked Watanabe for fraud. 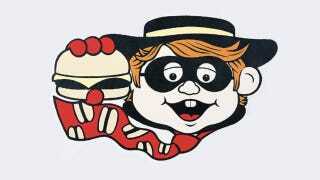 Authorities believe the man has pulled this scam over forty times, demanding money when he found a hair in his burgers. The arrest made the television news, and even showed Watanabe with a dramatic close-up.